Thirty years ago a microcap was defined as a public company < $50 million market cap. Most investors today define microcap as <$300 million, and that is what we use here at MicroCapClub. I’ve seen fund managers such as Royce Funds define microcap as < $750 million. For those of us that exclusively invest in microcaps, we know there is a big difference between a $600 million market cap company and a $25 million market cap company. The Russell MicroCap Index (IWC) in fact isn’t very micro. It’s more of a small cap index with an average market cap of $430 million, and holds quite a few companies with a $1 billion+ market cap. The fund manager started first and gave a few interesting names, most of which were $200-400 million market cap companies. I remarked jokingly, “Gary, I might as well just buy GE, what is the smallest piece of crap in your portfolio?”. He laughs and says, “XYZ company, $124 million market cap is the smallest. We really can’t buy anything sub $100 million due to liquidity. Our average market cap in the portfolio is $300 million” I tell him, “I think if I added the market caps of all my holdings together it doesn’t equate to $124 million”. He says, “I wish we could invest in the really small microcaps, but we are just too big”. This is a fairly typical conversation I have with most micro-smallcap money managers/fund managers. Of the 919 profitable companies between $300–750 million market cap, 112 (12%) are currently trading at < 12 PE LTM. Of the 831 profitable companies between $100–300 million market cap, 107 (13%) are currently trading at < 12 PE LTM. Of the 424 profitable companies between $50–100 million market cap, 69 (16%) are currently trading at < 12 PE LTM. Of the 882 profitable companies < $50 million market cap, 275 (31%) are currently trading at < 12 PE LTM. 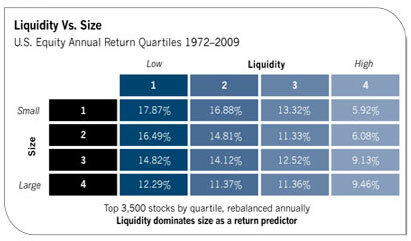 The smaller you go in microcap the more inefficient the markets become. Roughly half (49.4% to be exact) of all public companies on all US Exchanges + OTCBB + OTCM are microcaps defined by <$300 million market cap. A more staggering statistic is that 35% of all public companies are < $50 million market cap. These smaller microcaps, <$50m market cap, is where the greatest inefficiency lies. So not only are the cheapest stocks very small but there are a whole lot of them. This is why Warren Buffett and Peter Lynch first built their early wealth in this bastion of inefficiency before their assets grew so large they were forced up the food chain. When you really dive into why there are more cheap companies in the <$50 million, a major reason is this is where illiquid stocks call home. There have been a few academic studies, such as the Ibbotson Study, which analyzed returns of liquid vs illiquid small-mid-large cap companies. Ibbotson found that over a 37-year period liquid smallcaps returned just 5.9% annually compared to illiquid smallcaps, which returned a staggering 17.87% annual return over the same time frame. I’m sure this is also a big reason why the fund with the smallest average market cap ($78m) rated by Morningstar, Perritt Ultra MicroCap (PREOX), is also the top performing microcap fund over the last year by Morningstar. In 2013, it became cool again to say you invest in microcaps. This hasn’t been the case for a couple of decades. Historically, the only publicity mainstream financial outlets ever gave microcaps is to say how awful microcaps were. Of course, anyone with half an IQ just laughed because that thought process is what creates such ineffiency in the first place. Of course I’ve read several positive articles from these same sources recently. What a difference a year makes. Ok, so I’ve basically got way off track since the first paragraph. To bring this back full circle, is microcap getting too big? Yes, I think the definition of what is microcap has gotten a bit out of hand. I cringe when I think of a $300-400-500 million company as microcap, and if I had a vote I would say a definition of <$100 million is about right. In the end I guess it doesn’t really matter, but it’s fun topic to debate. I’m sure in another ten years <$1.5 billion will be considered microcap. Great; I’ve been looking for that Buffett quote forever. That quote is what originally inspired me to focus on microcaps. Thanks, yeah I also remembered reading it years ago, and it took some digging to find it.